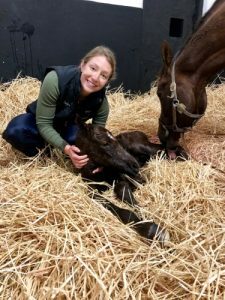 David Skelly (IRE) and Shayna Tiller (USA) give you an insight into their tenth week here on the Irish National Stud Thoroughbred Breeding Course. It’s hard to believe, but this week marks the halfway point of our time on the 2019 Irish National Stud Breeding Course. We have all settled well into our work, moving fluidly between yards and picking up right where the previous week left off. We’ve come together when things have gotten tough, and celebrated when times were high. As with any thoroughbred breeding season, some days are harder than other and we are so lucky to have each other to help through the tougher days. Shayna spent the week working in Sun Chariot, closely monitoring the soon-to-be moms as their impending due date grew closer. 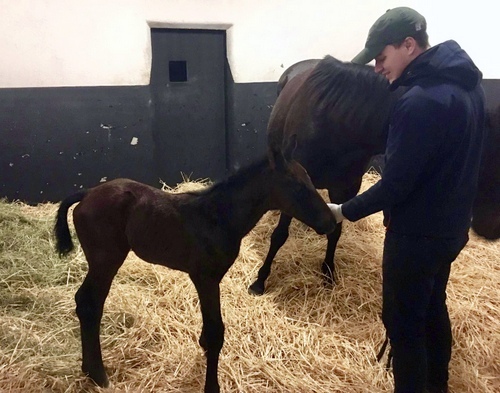 One of the farm’s famed mares Quevega, a four-time Gr.1 World Series Hurdles winner at Punchestown and six-time Gr.2 Mares’ Hurdles winner at Cheltenham, foaled a lovely, strong filly by Camelot on Sunday which was special to be a part of. Hopefully she will take after her talented parents and become a star herself one day. We enjoyed a phenomenal line up of lectures this week, with guest lecturer Harry Sweeney of Darley Japan teaching us about the dynamic and flourishing Japanese Racing Industry. The lecture was informational and inspiring, with many students from the course now considering working in Japan after graduation. Sieglinde McGee gave an interesting lecture on her passion in life, pedigrees. She took us through some of her favorite breeding lines and educated us on important qualities to consider when sorting through an individual’s pedigree page. Nessa Joyce, from the Irish European Breeders’ Fund, joined us for a lecture on the various racing and prize money incentives provided by stallion owners that has allowed Ireland’s racing to thrive. The scheme has been unbelievably successful, and it would be great for other countries to implement the same tactics to help the lower end of the spectrum find success. Friday marked a special day on the stud with two of our living legends, Hurricane Fly (15) and Hardy Eustace (22) celebrating their birthdays. Students and staff gifted the legends a birthday cake made from feed, carrots and apples, made by our Marketing Director Sinead Hyland. They recorded the legends devouring their birthday goodies and the video was a massive hit, receiving mentions from EBN, TDN as well as being shown on ITV Racing. All of Ireland seemed to put regular life on hold for the running of the esteemed Aintree Grand National on Saturday. The students and staff at the Irish National Stud participated in our own sweepstakes for the event, everyone being assigned a random horse from the 40-strong group of runners. As much as we wanted to root for our chance at winning the sweepstakes, all of our hearts were with defending Grand National champion, Tiger Roll. The little horse defended his title, becoming the first horse in 46 years to win back-to-back Grand Nationals. As this week comes to a close, we excitedly look forward to what the remainder of the course has to offer. With the weather warming, thrilling race days approaching and a great group to enjoy it with, we have a lot to look forward to.